One of the hardest parts about a vegan diet is the lack of traditional tasting, truly delicious tacos – and tacos are my favorite so obviously I had to find another way. That’s where jackfruit comes in. Young green jackfruit has an uncanny meaty texture to it when shredded. It’s ideal for vegan BBQ pulled pork, hearty chili, but most importantly…TACOS. Before you get too excited and run to the store for some jackfruit, make sure you know what you’re looking for – not any old jackfruit will do. You need young green jackfruit that is canned in brine not syrup. The jackfruit that is canned in syrup is way too sweet and is typically used for desserts. The first time I tried this recipe I couldn’t find the young jackfruit so I figured I’d just settle for some pre-cut ripe jackfruit. The texture and flavor was completely off! Ripe jackfruit is sweet and doesn’t provide that shredded meat texture that you get from the canned jackfruit. You can find the canned jackfruit in brine in most Asian grocery stores, at Trader Joe’s, or online. Just be sure to thoroughy drain and rinse the jackfruit because the brine can be bitter! Drain and rinse the canned jackfruit thoroughly to remove the brine (the brine can be bitter if not properly rinsed off). Add the jackfruit to a food processor and pulse until it is shredded and you reach a ‘pulled meat’ texture. Be careful not to over-shred the jackfruit. Wash and dry fresh produce. Peel onion, garlic, orange, and avocado. Thinly slice half the onion and dice the other half. Remove the pit from the avocado then cut into slices. Remove stems from cilantro then roughly chop the leaves until you have 1/4 cup. Remove stem from jalapeno, cut in half lengthwise, then remove the core and seeds (keep seeds in if you like it spicy). Heat a pan over medium-high heat then add a drizzle of olive oil. Add sliced onions to pan (saving the diced onions for toppings later) then add 1 tbsp of maple syrup to the onions (this will help them caramelize). Cook until onions have softened and are caramelized, about 4-5 minutes. While the onions cook, mix together the spice rub combining paprika, cayenne pepper, cumin, chili powder, oregano, coriander, onion salt, and salt and pepper in a small bowl. Season the jackfruit with the spice rub and toss to coat evenly. Once onions have caramelized, add the seasoned jackfruit to the pan with the onions and cook until slightly dry and browned, about 3-5 minutes. While the jackfruit cooks, add the orange, lime juice, garlic, jalapeno, 1 tbsp maple syrup, and water to a blender. Blend until liquefied and turned into a sauce. Once jackfruit has cooked, reduce heat to medium and add the blended sauce to pan. Bring mixture to a simmer and cook until most of the liquid has cooked off, about 10 minutes. Add the jackfruit carnitas mixture to tortillas then top with avocado slices, diced onion, cilantro, and vegan crema. Enjoy! *Double wrap the tacos with 2 tortillas if they are falling apart. Want to make this recipe even easier? My favorite online grocer, Thrive Market, offers pre-shredded and pre-marinated jackfruit carnitas! Just throw it in the pan for 5 minutes and it’s ready to go! 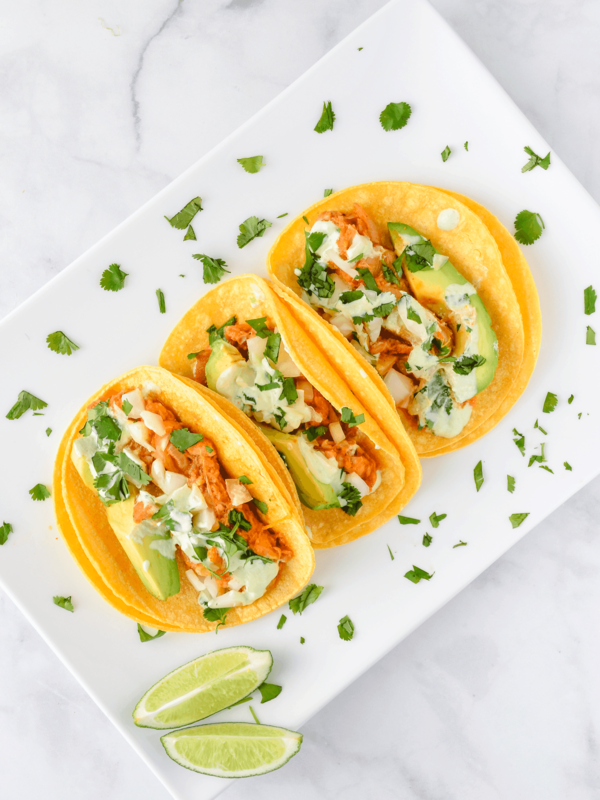 It’s not quite as good as this homemade version (ok I might be a bit biased here) but it definitely works if you want taco night without the hassle. I use Thrive Market to purchase all of my dry goods because they regularly save me 30% off my grocery bill compared to Whole Foods where I used to shop! You can get the Jackfruit Carnitas + an extra 25% off your first order here! These tacos can be a vegan lifesaver if you’re having Mexican food withdrawals. I recommend trying them with some black beans and my cilantro-lime cauliflower rice on the side! Did you try this recipe? Let me know in the comments below how you liked the tacos or if you have any feedback! Drain and rinse the canned jackfruit thoroughly to remove the brine. Add jackfruit to a food processor and pulse until shredded and you reach a ‘pulled meat’ texture. Wash and dry fresh produce. Peel onion, garlic, orange, and avocado. Thinly slice half the onion and dice the other half. Remove pit from avocado then thinly slice. Remove stems from cilantro then roughly chop the leaves until you have 1/4 cup. Remove stem from jalapeno, cut in half lengthwise, then seed and core. Heat a pan over medium high heat then add a drizzle of olive oil. Add sliced onions to pan (saving the diced onions for toppings later) then add 1 tbsp of maple syrup to the onions. Cook until onions are softened and caramelized, about 4-5 minutes. While onions cook, season the jackfruit with the spice rub and toss to coat evenly. Once onions have caramelized, add seasoned jackfruit to the pan with onions and cook until slightly dry and browned, about 3-5 minutes. While jackfruit cooks add the sauce ingredients to a blender and blend until liquefied and well combined. Once jackfruit has cooked, reduce heat to medium and add the blended sauce to pan. Bring mixture to a simmer and cook until most of the liquid has cooked off, about 10 minutes. Add the jackfruit carnitas mixture to tortillas then top with avocado slices, diced onion, cilantro, and crema. Enjoy! In a rush but still want to try some jackfruit carnitas tacos? Try this pre-shredded pre-marinated jackfruit carnitas and get an extra 25% off your first order!